tnaseem: Well, after deliberating for the last couple of years ;) I have finally switched to Slingshot (Unlimited). However, the sign up form stated it will take up to a week for some reason. Is this just standard wording? When I switched from Telecom to Actrix previously, the switch over happened the same day, so a little confused. I've emailed Scott too, as he asked me to let him know when I made the switch so he could make sure things went smoothly. I can pm/email my account number to whoever, if you need to check. I rang on Monday to change to unlimited and was told over the phone that it takes a week to switch. I got an email from them yesterday saying that it will be switched over on Thursday. I just had a call back from them now and they're sorting it and say it will in fact take several days, as they have to put in the 'request' to Telecom who then deal with the other provider, rather than doing it direct. Hopefully, it'll be done soon. Moreover, I hope it's worth it. Actrix were bloody good to me, and I hate leaving them... Having said that, so far Slingshot, 10/10 for your customer services team. Actually I would like to just say BIG ups to slingshot on the unlimited plan. we have been on it since day one initially there where some teething problems however they have managed to pull off what many other isps could not. The speed on this plan is very impressive considering the cost. Our flat has 5 geeks/gamers/media lovers in it and we couldn't go on anything other than unlimited. Big ups to you scott and your team. sapage: Gurezaemon - thanks for your feedback - send me an email and I will personally help you switch and ensure you get the broadband experience you are looking for. A couple of questions that I'm sure others are interested in as well. What sort of amount of time do I need to be offline at the changeover? If I'm going to be offline for 3 days when switching from Telecom to Slingshot, that could be a major issue, but a few hours would be tolerable. Also, what sort of time scale is needed, assuming I apply today? How long before I will be up and running? Stan: Actually I would like to just say BIG ups to slingshot on the unlimited plan. we have been on it since day one initially there where some teething problems however they have managed to pull off what many other isps could not. Havent heard back from my email to Scott re: billing change from the old AYCE to the new Unlimited, but am still very happy with the service - and for what we get, it's not such a big deal. We are all gamers/IT/media lovers and are in the same situation as Stan, slingshot have been the only ones able to supply us with the data we use. Even with the Pro 40GB with free offpeak, even though we were spending an additional $100/m on data packs, it was still beyond what anyone else at the time was able to offer us. In answer to these questions. Downtime depends on the type of switchover, but is generally just afew hours on a given day as the physical equipment is change (If applicable) and the PVC and tunneling are setup. Time scale is 5-10 working days for most switchovers, however this depends again on what needs to be done ona case by case basis. It can sometimes be much quicker but we can never garuntee it. My unlimited slingshot gets activated on the 24th of November; I changed from Naked DSL to having a homeline through Slingshot to get the unlimited package for $60 ($111 in total). I do not need a homeline as I have Voip; I will never my homeline so I will just be wasting an extra $20 that I really dont have. Can I please switch before the 24th to the new Naked unlimited plan please? with out incurring the homeline disconnection fee? kaljames79: My unlimited slingshot gets activated on the 24th of November; I changed from Naked DSL to having a homeline through Slingshot to get the unlimited package for $60 ($111 in total). The new plan is not available yet, It has simply been posted here as some information on what will be happening, but is not completed and available yet. The phone line gone off on mine this morning at 9am for around 10 minutes and its back up running. Lost internet connection since. got a txt at 11 saying my homeline is all good to go. At 3pm 2:30pm another txt saying my internet is good to go and voila ! Speed fast speed on this plan so fat testing youtube and 1 psp tvt website. Cant be happier. When you have Scoot helping you, rest assured that you will get your connection on the same day! Unless there's some unexpected installation issue. Hi stitch - what dsl sync speed is your modem reporting? sapage: Hi stitch - what dsl sync speed is your modem reporting? Hi Scott, it's me unlocker(changed my user name), I emailed you and you arranged a quick move for me. Thanks - that sounds like there is definitely a problem - if your dsl sync is 21mb , you must be mighty close to an exchange or cabinet. 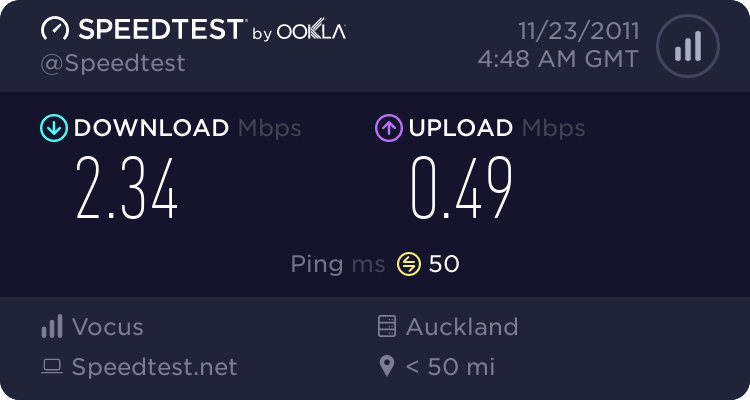 We will put a monitor on your line for starters - please use http://speedtest.slingshot.co.nz to do a few speedtests with nothing else running, and connected to modem via Ethernet - this records test results against your account and helps with faster diagnosis. sapage: Thanks - that sounds like there is definitely a problem - if your dsl sync is 21mb , you must be mighty close to an exchange or cabinet. Speed test done slingshot website are also same, less than 5Mb, nothing else running and connected direct. Line was perfect till last night and suddenly after switching to slingshot, internet is dropping like every 10 mins and speed is very slow. Scott, something definitely wrong at your end, some sort of cap on my line or throttling is in effect.